Markets continue to trade lower amid volatility as participants remain wary ahead of the US Federal Reserve meet and worries regarding a UK referendum that could push Britain out of the European Union. 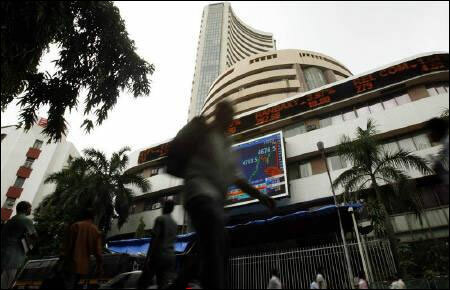 Weakness in the global equities amid decline in crude oil prices further dented sentiments. Meanwhile, traders are closely watching the progress of the monsoon, which arrived in southern India on Wednesday, a day later than forecast. 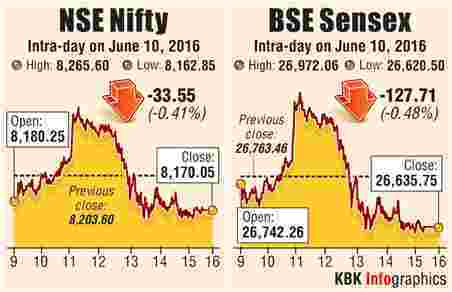 At 15:30 pm, the S&P BSE Sensex was down 136 points at 26,627.04 and NSE Nifty was down 34 points at 8,169.90. Infosys continues to lose sheen and has shed 0.3% amid worries that compensation increase and higher visa fees could impact margins in the first quarter of the current fiscal. Further, concerns that growth could remain volatile in the near term and cautious outlook for the retail sector among other verticals also dampened sentiment. The stock has also turned ex-dividend today for final dividend of Rs 14.25 per share for the year ended 31 March 2016. The FMCG major has forayed into the dairy whitener market with its Sunfresh brand, its second offering in dairy business, after it opened its innings in this space last October with packaged ghee. Shares of Adani Ports & Special Economic Zone have gained 0.4% after rating agency India Ratings & Research assigned a stable outlook for its proposed non-convertible debentures. Lupin lead the gains in the pharma pack up nearly 1%. The stock had witnessed profit taking in the previous session on talk that it is recalling over 54,000 vials of anti-bacterial injection, Ceftriaxone, at its Mandideep facility in Madhya Pradesh due to violation of current manufacturing norms. Meanwhile, its peer Dr. Reddy's Lab shed 0.3% after the U.S. Consumer Product Safety Commission charged the drugmaker with having failed to comply with rules on child resistant packaging for five of its products. RIL will be withdrawing from its ongoing arbitration with the government on pricing of natural gas, a person privy to the discussions between the company and the oil ministry disclosed. Not only will it bring to an end the face-off between the company and the government, it will also enable RIL to avail of the recently approved liberal gas pricing regime. The stock is up 0.2%. M&M climbed 0.5% after media reports stated that the Mahindra group is in talks with taxi aggregators Uber and Ola for a strategic alliance to offer a wide gamut of services. Vedanta rises 3% after CLSA upgraded Vedanta to buy from sell with an increased target price of Rs.150 from Rs.70 per share. Shares of logistics companies extended gains for the fourth straight session in an otherwise weak market on hopes of clearance of the goods and services tax Bill in the upper house of the Parliament.Gati, Snowman Logistics, Sical Logistics, Allcargo Logistics, Patel Integrated Logistics and VRL Logistics gained in the range of 1%-7%.